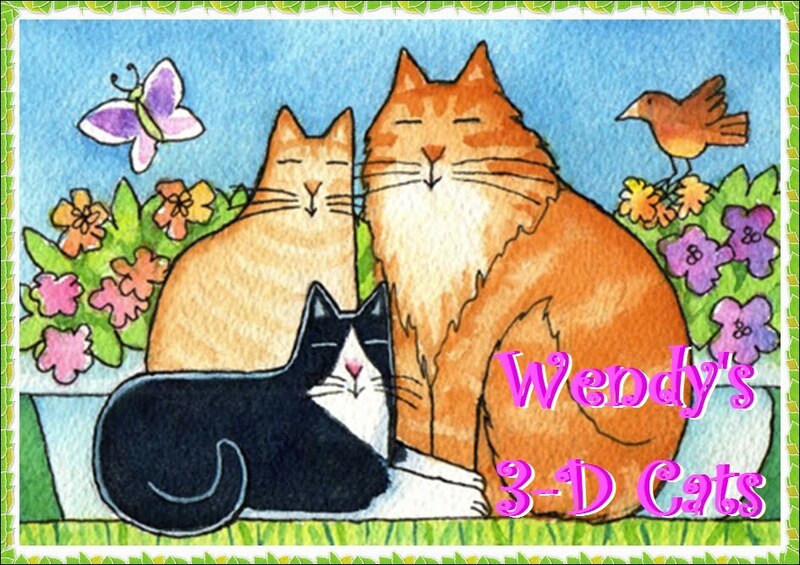 Wendy's 3-D Cats: 3-D SUNDAY CHAPEAUX: TIME FOR TEA! The 3-Ds are in their Sunday best for Domino's annual tea party. They're all dressed up with someplace to go! 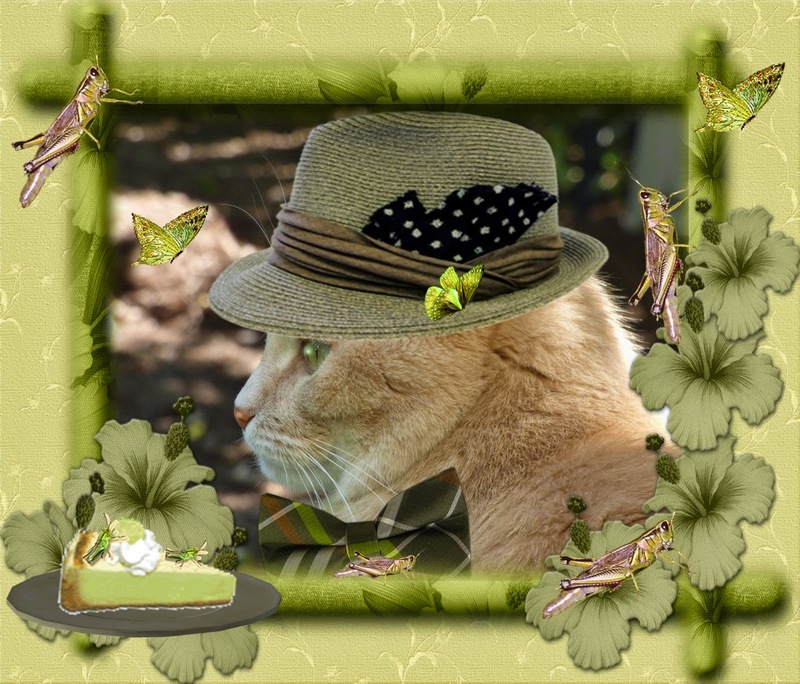 Dylan has donned an olive green fedora with brown band and polka-dot pawkerchief (just in case he sneezes) and his bowtie has equally mewted tones. Knowing his penchant for grasshoppurrs, Domino has baked him a grasshoppurr pie. He'll just have to keep all of their relatives away, so he can actually eat it! "Ware dere's wun grasshoppah, dere's hundreds! ", says he. "Da population has jus' mushroomed." Dante is dashing in his black straw fedora banded in teal with a bowtie to match! Although he was hoping for some mouse-kebobs on the grill, this is a tea party and he has to settle for lighter fare -- or does he? 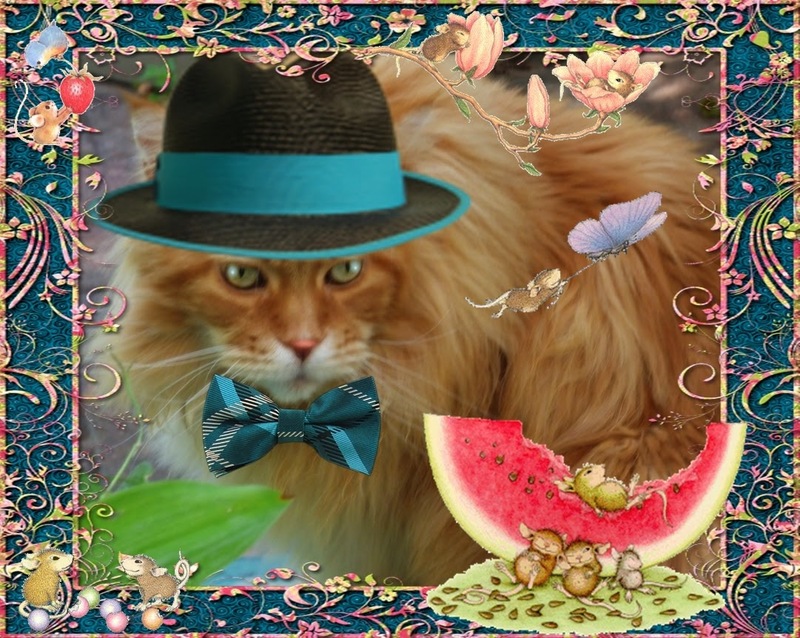 A few watermelon filled mousies might hit the spot -- mmmm, juicy! 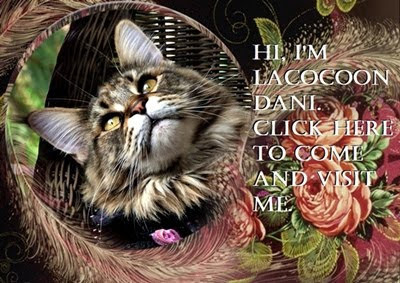 "Despite all of Domino's prepurrations, this is still quite a seedy affair! ", says he. 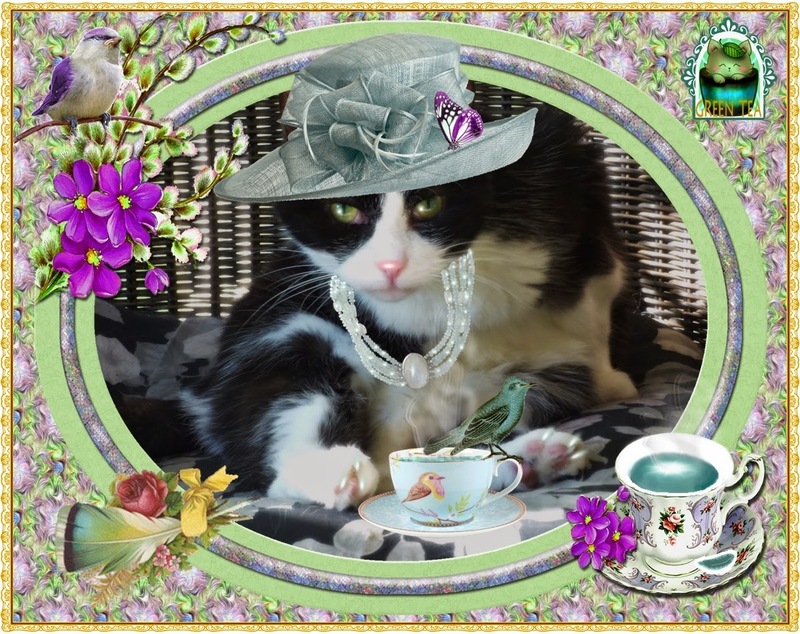 Domino is purristine in her pale teal summer hat, adorned with multiple bows, and her coordinating multistrand pearl necklace. "Dis is for da birds! ", remarks Domino. "Wifout dem, my tea parteh woodn't be compleet." Yes indeed, steaming a green bird in a cup of hot water produces quite a flavourful beverage. No wonder green tea has such miraculous properties! "Those in glass houses, shouldn't throw a fit!" says the bird quite sensibly. "See you later", says Domino. "Is time to tea off!"